This is one recipe that can make 4 or 5 different truffles. Change the liquor and the coating and there you go. These are made with Cognac but you can use Brandy, Rum, Cointreau, Bourbon, almost all of the dark liquors will work well. 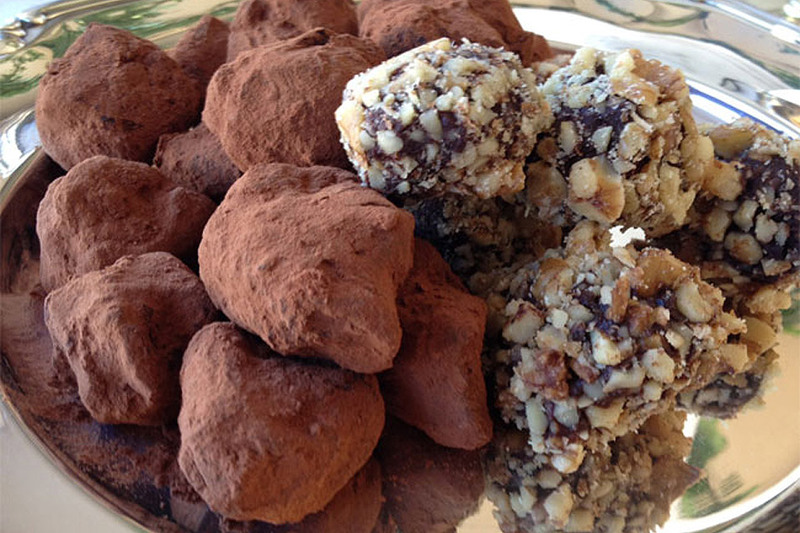 This is one recipe that can make 4 or 5 different truffles. Change the liquor and the coating and there you go. These are made with Cognac but you can use Brandy, Rum, Cointreau, Bourbon, almost all of the dark liquors will work. Place in one bowl the chopped up chocolate. In a small pot place the cream and butter and heat until it is just ready to boil. Pour the hot cream over the chocolate and let sit for one minute (this is important). With a rubber spatula gently mix the cream, butter and melted chocolate together. Add the liquor and vanilla and gently mix it in. Cover the mixture and place in the fridge for several hours to get cold. You can do this the day before. When chilled, using a melon melon baller, mini ice cream scoop or spoon, scoop out small balls (about the size of quails eggs) and roll them in your hands. This will help to make the outsides of them warm so that your coating will stick better. Then drop them into the cocoa or chopped nuts. Once this is done they are ready and you can store them in a plastic container in the fridge for up to 2 weeks. You can even freeze the small balls before you coat them and then defrost them in the fridge. It's a bit surprising that people don't seem to make these very much or only at holidays. They make a fantastic gift if you are going to someone's for a dinner. 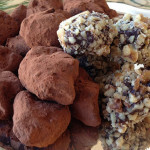 Things you can coat a truffle with are coconut, chopped walnuts, pistachios or hazelnuts and of course cocoa powder. You can use many things, you are only limited by your taste and imagination.